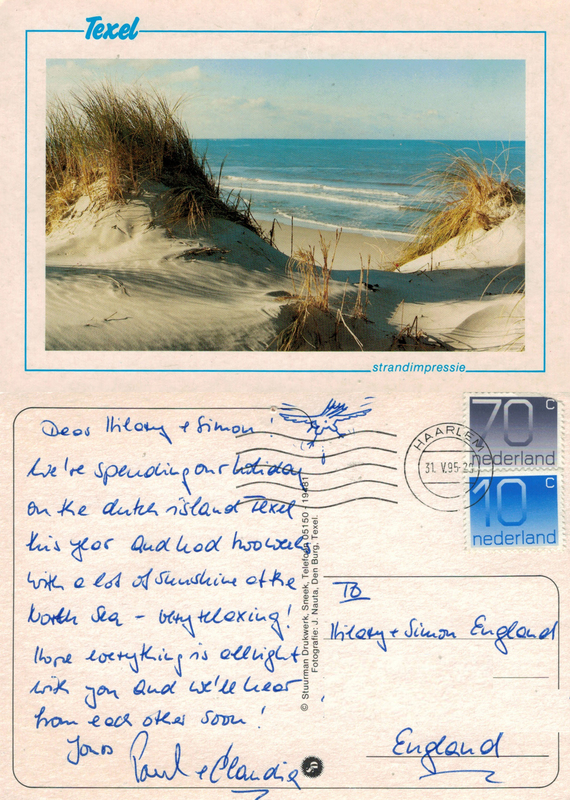 There is a little sketch of a seagull at the top of this card, which at first glance looks printed on but is in fact drawn by Claudia – look even closer and you’ll see the seagull relieving himself, perhaps this is the only hazard to be found on the peaceful island of Texel? The postmark reads ‘HAARLEM 31 V 95’ and carries 80 cents of stamps. Claudia and I exchanged letters and cards between Germany and the UK for many years, losing touch some time in the 1990’s. Amazingly, in ‘parallel’ lives fashion, she recently found some old letters from me, did a quick internet search and got back in touch via this blog. Even more amazingly, Claudia had planned a visit to London last weekend, so we met for an afternoon and caught up the last 20 years. We got along very well, helped by her ability to speak fluent English; and as she pointed out, we already knew lots about each other as we’d always written long and detailed letters. I’m confident that we’ll continue to be good friends into the future 🙂 Happy Endings/Beginnings! This entry was posted in art, autobiography, Friendship, History, Postcards, Travel, writing and tagged Claudia, friends, friendship, German, London, pen friend, reunions, travel, writing. Bookmark the permalink. Paul draw the seagull.He did it on every postcard that year.It was our first holiday on Texel and we both fell in love with the island. I’ ll write more tomorrow via mail!